She amazed doctors with her resilience and sunny disposition in the face of a life-threatening illness. Now she is bringing hope and encouragement to children and families across the country. Each year, Children’s Miracle Network Hospitals, an alliance of pediatric hospitals in the U.S. and Canada, identifies a child with a remarkable medical story from each member hospital. These “champions” serve as the face for millions of children treated at the local Children’s Miracle Network Hospital every year. Sanford Children’s Hospital announced last year that Scarlett Schneider, the daughter of Becky and Sheldon Schneider of Minot, would be the 2019 Children’s Miracle Network Hospitals North Dakota Champion. Last year, Scarlett was diagnosed with a rare case of pediatric lupus, which nearly took her life. She recovered after a lengthy stay at Sanford Children’s Hospital in Fargo, the region’s only Children’s Miracle Network Hospital. Being a Champion means Scarlett’s story is among those being shared at Children’s Miracle Network Hospitals-sponsored fundraisers and on the Children’s Miracle Network Hospitals website. She was also featured on the Cares for Kids Radiothon benefiting Children’s Miracle Network at Sanford Children’s Hospital in Fargo in January. “We weren’t able to be there because Scarlett was sick, but we’ll be attending Sweet Miracles, another fundraiser in March, where there will be a medal ceremony recognizing Scarlett,” Becky said. Scarlett’s story began in late 2017 when she was just two years old. She fell ill after contracting a respiratory virus. After experiencing a pulmonary hemorrhage and cardiac arrest, she was transferred to Sanford Children’s Hospital, where doctors initially suspected leukemia. It turned out to be lupus, a condition rarely seen in children, in which the body attacks itself. During a three-month stay in Sanford’s pediatric intensive care unit, Scarlett suffered multiple pulmonary hemorrhages and endured aggressive treatments, including chemotherapy and 100 days on ventilator support. “We were told she had less than a 1-in-10 chance of survival,” Becky said. Despite the odds against her, she slowly improved, and after four months she was well enough to leave the hospital. 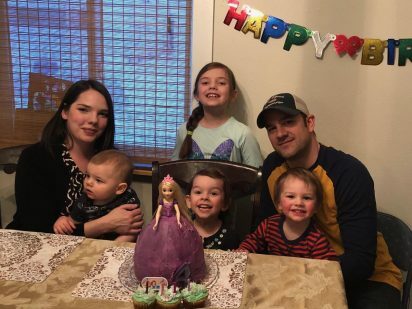 Now, Scarlett, who turned four on February 12, is at home with her family and doing well. “All of her lupus labs are good,” Becky said. “It’s under control. Kidneys can be an issue with lupus, but her function is fine.” Scarlett is also getting her strength and muscle tone back with the help of Trinity Health Pediatric Therapy. “She’s running and jumping like any other kid,” Becky added. There are challenges ahead. Scarlett is currently on a medication that suppresses her immune system, which requires her parents to be vigilant about avoiding exposure to all types of pathogens. Although Scarlett is reportedly taking her Champion status in stride, her mom is eager to share her family’s experience as a way to help other families. She plans to attend the Lupus Advocacy Summit next year in Washington D.C., and the family launched a website, www.mychildhaslupus.com, to share Scarlett’s story and connect with other parents of children who have lupus.